Dustin grew up in a small community where football, basketball, wrestling and baseball were the emphasized sports in high school. “I never had the opportunity to play competitive volleyball. I always enjoyed playing volleyball in church sports programs and at those oh-so-fun family reunions, but I wanted to excel in the sport.” said Dustin. After setting a personal goal a couple of years ago to play competitively, he feels great to see the progress he and his team have made and be on the winning end (rather than on the losing end) of local leagues and tournaments. “Early-on in the season, we had some tempers flare and team chemistry issues arose. Because of those issues, we lost some games.” said Dustin. 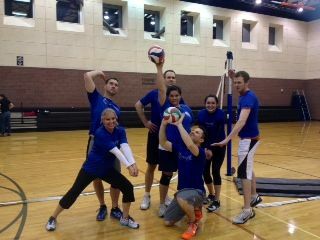 The coed team, consisting of 3 men and 3 women, pulled together and through communication and refocusing on working together as a team, they were able to win 10 out of their last 12 games. Team Jorgenson was seeded 2nd going into the tournament. They posted wins against the first two teams then lost to the top-seeded team, team Pancake, in an intense best-of-3 nail biter (to win a match, you must win 2 out of 3 games). The team had to work hard to win their next two games to make it to the championship through the loser’s bracket. Who was their opponent? 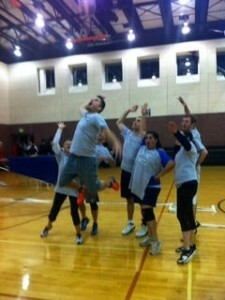 –Team Pancake—their only loss in the tournament. After splitting two games, with one win a piece, the heart-pounding action continued in the third game. Team Pancake was able to tie the final game up at 14. Team Jorgenson played through some hard-fought rallies and they prevailed in the end. The team felt great to win it all after going head-to-head with such evenly matched teams. The team had a great season, and Jorgenson Companies is proud to sponsor such a great group of athletes. Jorgenson Companies also sponsors a softball team who will begin their season on April 17th, 2013. Follow our blog for updates and stories about their season. We’re looking forward to lots of great competition!